After a postcollegiate career running shorter distances, Smith embraced ultrarunning in 2002 and has enjoyed success in distances ranging from the 50-mile run to the 24-hour run. She is a former 24-hour and 100K national champion. She has had the privilege of representing the United States on two 24-hour national teams (2005, 2007) and is a six-time 100K national team member (2004, 2007, 2008, 2009, 2010, 2011). As a runner, she is a national age-group record holder and a member of the 100-kilometer national ultramarathon team. In 2009, she held the fastest time in the world for the 50-mile ultramarathon and was ranked No. 1 in that event in the United States. She represented the United States for the sixth time in the 100-Kilometer World Cup, which was held in the Netherlands in 2011. In 2011 she set a national age-group record for the 12-hour run, finishing first among all participants in the FANS 12-hour ultramarathon in Minnesota, running 83 miles in 12 hours - more than 12 miles ahead of the second place finisher. 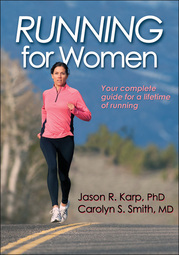 “In Running for Women, Dr. Karp and Dr. Martin provide women and their coaches a clear path to success and enjoyment in training and racing."